Velda Tindall Smith was a classic cowgirl from the golden age of rodeo. She learned to trick ride at the age of twelve and gave her debut performance the following year to a crowd of 8,000 at Gilbert’s Ranch Rodeo. Velda consistently placed high in trick riding, flat races, and relay races at major competitions like Cheyenne Frontier Days. As trick riding became less profitable, Velda began a career as a barrel racer and helped to form the Texas Barrel Racing Association. 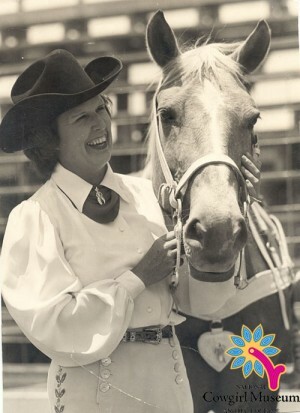 She served as president for five years and at the age of 54 won grand champion barrel racer at the 1964 Dallas Fair.